Warning. Follow these instructions at your own risk. I am not responsible when you use dd to blow away your kitty pictures. Download the FreeBSD 8.1 memory stick image from a FreeBSD repository. I picked one from here. Plug in your USB stick. OS X will mount it. You want to unmount the volume while keeping the drive available. To do this, open Disk Utility, click on the name of the mounted volume, and click the Unmount button. Now you need to know the disk's identifier. 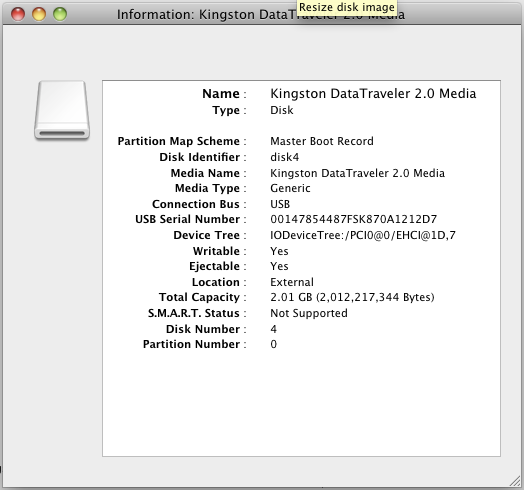 You can find this out by right-clicking the disk in Disk Utility. The disk identifier of my USB stick was disk4. Finally, copy the memory stick image onto the memory stick, substituting the disk identifier into this terminal command. if means "in file" and of means "out file". So the commands I issued looked like this (yours will be different, since your disk identifier will be different). Back to Disk Utility. Select the memory stick. Click the Eject button. Now go boot FreeBSD! Permalink Submitted by William (not verified) on Tue, 2014-10-07 14:17. Could you explain how to select the -bs and -conv options? Could you exclude them? Thanks. Permalink Submitted by John on Tue, 2014-10-07 20:56. Honestly I don't remember where I got the block size. Of course there's a Stack Overflow answer. If you exclude them the copy may take longer. Probably not a big deal.